Constantine the Great, AD 307 to 337. AE 3. - Constantinana Dafne issue. Denomination : AE 3. Mint : Constantinope, 2nd officina. Size : 18.8 x 19.5 mm. Weight : 3.07 grams. Reference : RIC page 574, #35. Grade : XF with a dark green smooth glossy patina. A very attractive coin in the hand. Obverse : Diademed head of Constantine right, with CONSTANTINVS MAX AVG round. 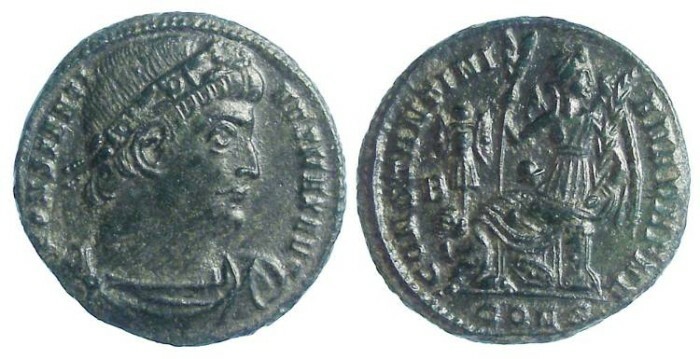 Reverse : Victory seated left on acippus, head right, palm branch in each hand, with a trophy including a seated captive on the ground to her left, with CONSTANTINIANA DAFNE around, the officina mark B in the left field, with the mint mark CONS below.